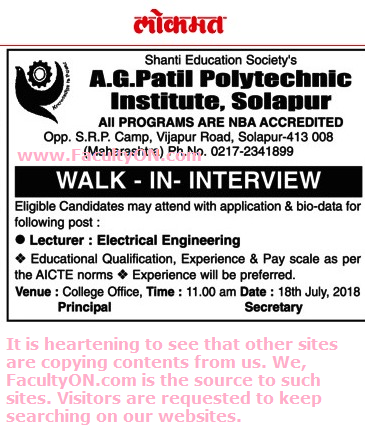 A.G.Patil Polytechnic Institute, Solapur has advertised in the LOKMAT newspaper for recruitment of Lecturers jobs vacancies. Interested and eligible job aspirants are requested to walk-in on 18th July 2018. Check out further more details below. About College: Shanti Education Society’s A. G. Patil Polytechnic Institute, established in 2008, started evolutionary ideas and ample innovativeness to provide a word class education in the field of Engineering and Technology in Solapur region. The institute is approved by AICTE, New Delhi & DTE, Mumbai affiliated to MSBTE, Mumbai and recognized by Govt. of Maharashtra. As per AICTE norms. Experienced candidates will be preferred. How to Apply: Interested and eligible candidates are requested to attend the Walk-in interview with their application and bio-data to the walk-in address provided below.